As part of Google's ongoing mission to make information more readily available we recently collaborated with the University of Colorado, Boulder to hold an event for scientists and researchers in the area. 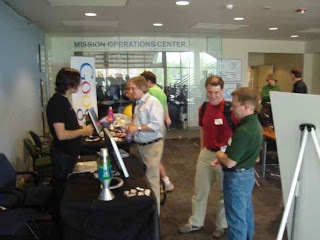 The event focused on finding ways to use KML and Google Earth to display and communicate scientific research with policy makers, students, and the public. The event was hosted by the Laboratory for Atmospheric and Space Physics as part of the Electronic Geophysical Year program. 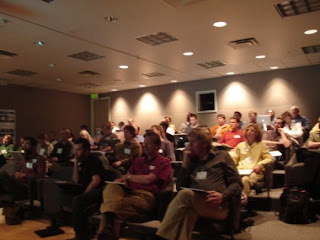 As part of the event, scientists from over a dozen organizations including NCAR, NOAA, NSIDC, CIESEN, USGS, and the IPCC attended and presented their work. Tutorial sessions for all skill levels were held to demonstrate tricks and techniques for displaying larges amounts of data, translating data formats, and using KML to describe complex data sets. Dan Baker, the Director of the Laboratory for Atmospheric and Space Physics, explained that "[t]he interactions between the Boulder community and the Google team suggests that there is immense potential now and in the future for Google Earth and the KML tools to fill important analysis and display gaps." This was an exciting opportunity for Google engineers to interact with and hear from scientists and researchers directly in what will hopefully be only the first of many events to come.